After a miserable 73 win season, the White Sox leadership decided to retool for a title run. The presence of Jose Abreu and Chris Sale on cost effective contracts allowed the club to aggressively pursue reinforcements. They may only project to win 78 games, but this is a high floor team with plenty of breakout potential. The lineup added Adam LaRoche and Melky Cabrera. We'll also see a new look at second base – possibly the fleet footed Micah Johnson. The rotation was reinforced with Jeff Samardzija. The bullpen was a major weakness in 2014, but now David Robertson and Zach Duke will give Zach Putnam and Jake Petricka time to develop in middle relief roles. Sale is coming off the best season of a very good career. The soon-to-be 26-year-old is recovering from a foot injury. He appears to be in line for an early to mid-April return. Since he'll only miss a start or two, you can continue to invest in him as a top pitcher. The southpaw has a 95 mph fastball, 93 mph sinker, wipeout slider, and plus changeup. Samardzija, one of the big offseason investments, is currently the 17th pitcher selected in NFBC. While I don't disagree with that draft cost, I do worry about his ability to replicate his success. He allowed a 2.99 ERA with 8.28 K/9 and 1.76 BB/9 last season. His five pitch mix is electric – especially a 95 mph fastball, tight slider, and plus splitter. He'll need to maintain an elite walk rate if his ERA is to remain around 3.00. It might be safer to grab a hitter with the 75th pick. Like Sale and Samardzija, Quintana also had a career season in 2014. Unlike that duo, no obvious improvement appeared in the underlying peripherals. Instead, he simply allowed half as many home runs. There's no sign that the change is sustainable. U.S. Cellular Field is a bandbox, so expect a normal home run rate in 2015. Even so, Quintana maintains a certain usefulness to fantasy owners. Expect something around a 3.85 ERA, 7.50 K/9, and 2.50 BB/9. He's the 52nd pitcher off the board, which smells appropriate. The White Sox have several depth options, the best of which are Hector Noesi and Carlos Rodon. Noesi has struggled in parts of four seasons, but he gradually improved once arriving in Chicago. He has a six pitch arsenal, and each offering shows some promise. He has breakout potential beyond his 4.75 ERA, 6.42 K/9, and 2.92 BB/9. Consider him for spot starts against weak lineups. Rodon was the third overall pick last June. The 22-year-old is on the fast track to the majors. He has big strikeout stuff, but he's struggled with command and control as a professional. His slider is sometimes given an 80 grade on the 20-80 scale and his fastball runs up to 97 mph. For years, Robertson has weaved closer-quality numbers. In 393 career innings, he has recorded 11.99 K/9, 3.80 BB/9, and a 2.81 ERA. Recent years have included much better walk numbers. In his first spin as the Yankees closer, he saved 39 games with a 3.08 ERA, 13.43 K/9 and 3.22 BB/9. The sole blemish was a slightly elevated home rate. It's a forgivable shortcoming at Yankee Stadium. The emergence of Dellin Betances allowed the Yankees to let Robertson walk. The White Sox bullpen blew 21 saves last year, so it made sense to invest in Robertson. He should remain among the top 10 relievers. If anything goes wrong, Duke, Putnam, and Petricka are all passable options. After producing a league average offense in 2014, GM Rick Hahn purchased reinforcements. Adam Dunn and Paul Konerko were replaced with LaRoche and Cabrera. With Abreu anchoring the lineup, there is potential for a lot of noise. 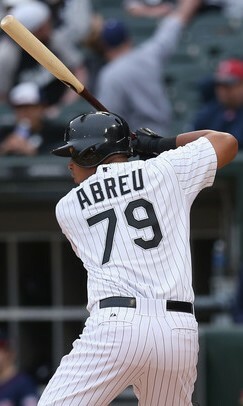 We know Abreu is a monster. He hit .317/.383/.581 in his debut. He probably won't hit over .300 again due to a high whiff rate. However, the power is real. Look for another 30 to 40 home runs. Unless you have the sixth to eighth pick in the draft, you probably won't have the opportunity to roster him. Adam Eaton and Cabrera are likely to bat ahead of Abreu. If you're looking for runs, they're great targets. Eaton is a breakout candidate who could eclipse 700 plate appearances. He doesn't have much power, but he could swipe 15 to 20 bases. He's a high contact hitter with good plate discipline. If healthy, he'll score over 100 runs with a useful batting average. Regardless of PED history, Cabrera is a pleasure to watch at the plate. After recovering from a scary back injury in 2013, he wrangled a .301/.351/.458 line last season. Hitting ahead of Jose Bautista and Edwin Encarnacion helped. Like Eaton, he's a high contact guy who should score droves of runs. Unlike Eaton, he has 10 to 20 home run power. He's slowed down in recent years, so don't expect more than a handful of stolen bases. Avisail Garcia is a high risk, high reward sleeper. He frequently draws comparisons to Miguel Cabrera, but don't be fooled. He'll need to solve a high whiff rate before he can unlock his 30 home run potential. Expect a bumpy season with the occasional moon ball. If you want to gamble with your 181st pick, take a look at A.J. Pollock or Joc Pederson. They offer five category potential. If you're looking for a deep sleeper, keep an eye on Johnson. The 24-year-old prospect is battling for the starting second base job with Gordon Beckham, Emilio Bonifacio, and Carlos Sanchez. He's often described as a running back. Two hamstring injuries limited him to 22 steals last season. In 2013, he swiped 87 bags. He's a contact hitter with minimal power. The White Sox are the 19th club in our power rankings series. A top heavy rotation, near-elite closer, and plenty of offensive firepower will give the club a shot at the postseason. Fantasy owners should have no trouble identifying blue chip studs and inexpensive sleepers on this roster. The franchise is dependent on a few elite players, so a couple ill-timed injuries could sink the season.